(Nanowerk Spotlight) It is not often that the prefix multipliers kilo and nano come together, and when they do, it usually is in the opening chapters of physical sciences textbooks where the point is made that the universe around us spans enormous space and time scales while operating in unimaginably small ones. We are truly awestruck and inspired by the tension. Kilometer-long nanowires do have a similar eponymous echo. Nanowires – man-made materials only a few nanometer in diameter with properties unusually attractive to make them the focus of nanotechnology and materials research today – are rarely a fraction of a millimeter long. They are especially interesting due to their one-dimensional structure through which they can be used as interconnects and when crossed over as switches or pixels. Miniaturization is sought everywhere in technology – it means much less power to operate, much quicker response time, and higher packing density. Here is the catch, though: How do you collect and manipulate these nanoscale structures, and then connect them to our macroscale world? Nanowires' promise might be appealingly big but their sizes are too small. Already, the chemical synthesis of nanowires and connecting them as functional devices has been perfected to a degree that now it is possible to grow nanowires with radial and axial heterogenous materials; to make branched wires; and connect a large number of them as transistors for computation or customize their structure for high resolution cellular sensing. These are all prototype devices, with high-scale integration and mass production requirements impeding their wide application beyond research laboratories. The main holdback being their alignment, positioning and integration into large scale systems, microelectronics for example. The chemical synthesis method in most instances requires a post-processing step to devise functional devices from the nanowires. A new fabrication method is therefore welcome to address these issues. We have now reported the first successful fabrication of arrays of millions of ordered indefinitely long nanowires and nanotubes in a flexible polymer fiber. The results are kilometer-long nanowires – a novel approach to nanowire fabrication that might bring with it fresh solutions. Our fabrication process is a radically new approach to nanowire and nanotube production. Unlike conventional bottom-up fabrication methods, it yields high throughput and ordered structures that can be easily integrated into microsystems. The nanostructure sizes are uniform for hundreds of meters along the fiber and radially homogeneous in the cross-section. We obtained unique multimaterial core-shell nanowire arrays and nanowires and nanotubes can be extracted to obtain extremely long free-standing slivers. Ultralong semiconducting core/piezoelectric shell nanowire array mass-produced by a new top-to-bottom fabrication scheme in nanotechnology. 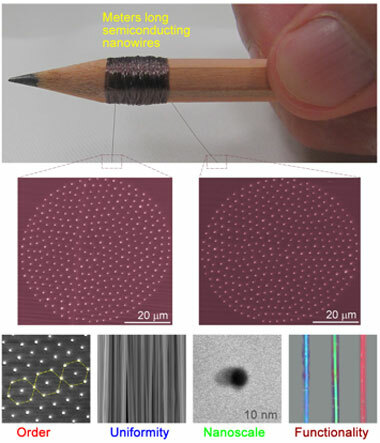 Polymer embedded nanowire array rolled around a pencil truly spans macroscopic and nanoscale worlds. 360 nanowires having uniform diameters in polymer matrix forms a hexagonal lattice which preserve its uniformity and symmetry over macroscopic length scales. Computer controlled thermal size reduction system allows production of ultralong nanostructures with diameters as small as 10 nm, even below. Semiconducting nanostructures show unique functionality such as size-dependent structural coloring below 200 nm in diameters (Credit: Mehmet Bayindir, UNAM-National Nanotechnology Research Center). The new fabrication technique we reported in the June 12, 2011 online edition of Nature Materials ("Arrays of indefinitely long uniform nanowires and nanotubes") is essentially a size reduction technique: Computer-controlled thermal size reduction is repeated iteratively until a macroscopic rod is scaled down to nano sizes radially (with diameters as small as 10 nm, even below) while elongated axially. In this way, a variety of semiconducting, piezoelectric and polymer nanowires and tubes can be produced. Millions of ordered, indefinitely long nanowires, nanotubes, and one-dimensional core-shell structures are obtained in a protective polymer. We start with a macroscopic polymer rod with an annular hole which is tightly fitted with a thermoelastically compatible material that is to become nanowires on multiple axial elongation and radial reduction. Millimetric fibres obtained from the first thermal size-reduction step are cut and arranged in hexagonal lattices inside a protective jacket, vacuum consolidated and redrawn. This second step reduces the wire size to a few micrometers. The drawing step is repeated a third time with the fibers obtained from the previous step to obtain nanometer-sized wires. Typically, macroscopic rods are reduced by 25- to 300-fold within each step. Using a reduction factor of 50-100 for three iterative steps, a 10 mm initial rod is reduced to hierarchically ordered 10 nm wires. The nanostructures are aligned and ready to be connected to large scale systems through the facets of the fiber in order to use their nano-features, such as photoconductivity or phase change properties. But the use of the structures is not confined to electronics. These nanowires can be used in large area photonics applications as non-pigment colors or in next generation solar cells to improve efficiency as effective light concentrators. It seems fiber drawing has just been reinvented in the age of nanotechnology.